Golf is a classy game and when you get to play a chance in one of the beautiful courses the whole idea of the game goes to the next level. A technical ground with steep hills in between the boxes, wonderful views, and excellent bar is all that you wish for to spend a summer afternoon outdoors. The environment is cozy and pleasant both near the reception and in the field. With an excellent restaurant which serves good food, you will have a fun time playing your favorite sport here!! Create a customized plan for your visit using the Castello D'aviano trip planner. You can use ready templates or start from scratch for the same. Add comfortable hotels to your plan, choose from the recommended hotels in Castello D'aviano like Hotel Santin, Hotel Antares and Aviano Palace Hotel. Generate executable plans on your own or book the top rated Castello D'aviano vacation packages for your visit. Read more on how to reach Castello D'aviano. Love this? Explore the entire list of places to visit in Castello D'aviano before you plan your trip. Fancy a good night's sleep after a tiring day? Check out where to stay in Castello D'aviano and book an accommodation of your choice. Camps are beautiful! Mountains, the sky, golf and you! New clubhouse with no service yet but liked the course especially the first 9! Beautiful course. Would recommend a cart as there is a significant amount of steep hills between tee boxes. Challenging back 9. Closes early. Discount if you work at Aviano AB. Non ci sono stato al Golf Club, non lo posso recensire, quello che posso fare è descrivere quello che ho visto. Mi trovavo da quelle parti ed avevo tempo disponibile per una passeggiata. Ho preso la stradina che parte dalla piazzetta "belvedere" e piano piano sono sceso, sono sbucato poco più in giù. 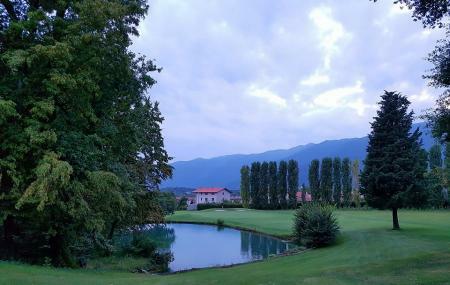 Il panorama era intenso forte, bello, la piccola chiesetta di San Gregorio di fronte, sulla sinistra a metà costa Villa Policreti e sullo sfondo i campi da Golf, con la nuova Club House/ristorante. Devo dire, molto molto bello. L'unico neo il parcheggio, solo in piazza si può fare e non sempre si trova. Ho visto solo uno stallo dedicato alle persone con disabilità. Qualche difficoltà a scendere in carrozzina lungo la stradina. Comunque se passate da quelle parti merita fermarsi.